“I was born in a city that has everything from A to Z in the USA,’” says Sister Alfonsina Sanchez, echoing a phrase used to describe her hometown of Azusa, California. A member of the Carmelite Sisters of the Most Sacred Heart of Los Angeles for more than 70 years, she now lives in the community’s retirement facility, just minutes from Azusa. Born in 1921, Sister Alfonsina is the second daughter of a family that included 10 girls and 8 boys. Growing up during the Great Depression, she often helped her mother with the younger children and particularly with the sewing. Early on, she began to consider a religious vocation, but she was concerned about leaving her family. “I was thinking of becoming a nun, but I was worried,” she explains. “So I started a novena to St Thérèse (of the Little Flower) asking her to decide.” When her family was able to find a home where they would be secure, Sister Alfonsina knew she had received her answer. Although cooking was a primary responsibility, Sister Alfonsina also ministered in other roles, including as a teacher’s aide. “I enjoyed getting the little children to learn their ABCs,” she says. For a time, she also oversaw the community’s postulants. (Postulancy is one of the initial stages of formation in religious life.) One of the first groups she worked with included Mother Judith Zuniga, who is now the community’s superior general. 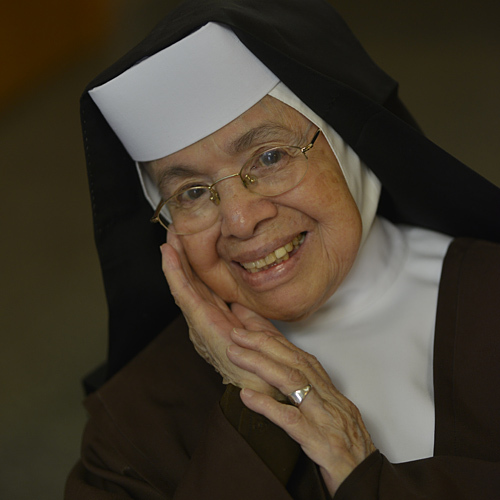 “Mother Judith always tells me, ‘You were my first teacher,’” says Sister Alfonsina.